On the way home during my lunch hour or after my work out I think of the last few leftovers and what ever else I have in the fridge. The creativity that comes over me has a certain way of satisfying my hunger. Strangely even when the fridge is nearly bare I am able to throw together some pretty tasty meals, I love the way they turn out! These are my hunger games. Meal planning isn’t all about fixing 6 lunches and dinners during the weekend, not for me anyway. 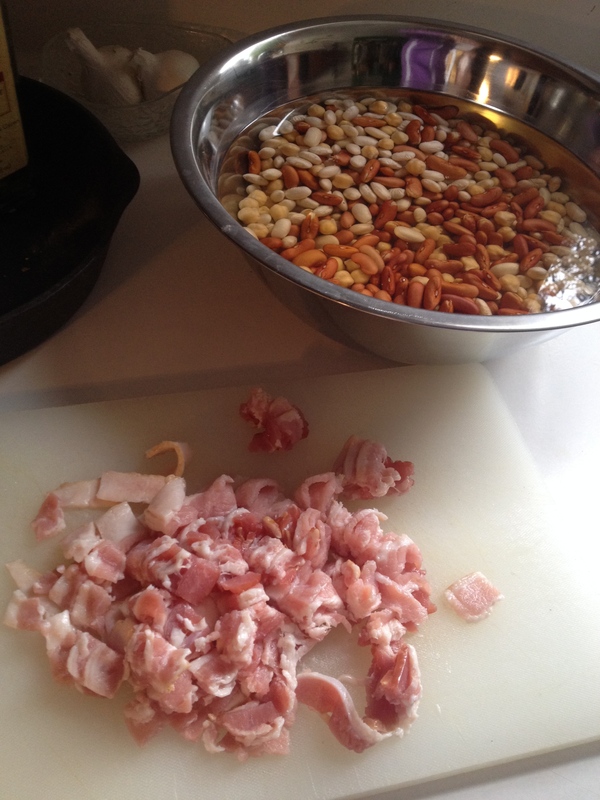 Its about utilizing the food I buy and preparing it with the time I have. I use some time on the weekends to make something that takes a lot of time or even just poach some chicken breast and clean some greens. 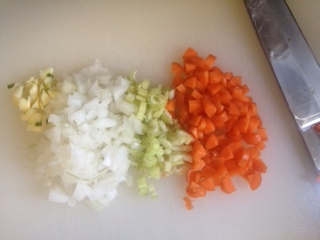 In the mornings before work, I steam or prepare my vegetables or thaw something from the freezer, soup, meat sauce, meat or fish and then my hunger and creativity take over each day. For example throwing a potato In the oven for an hour in the morning and using leftovers to make a meal is fast, healthy and delicious…. 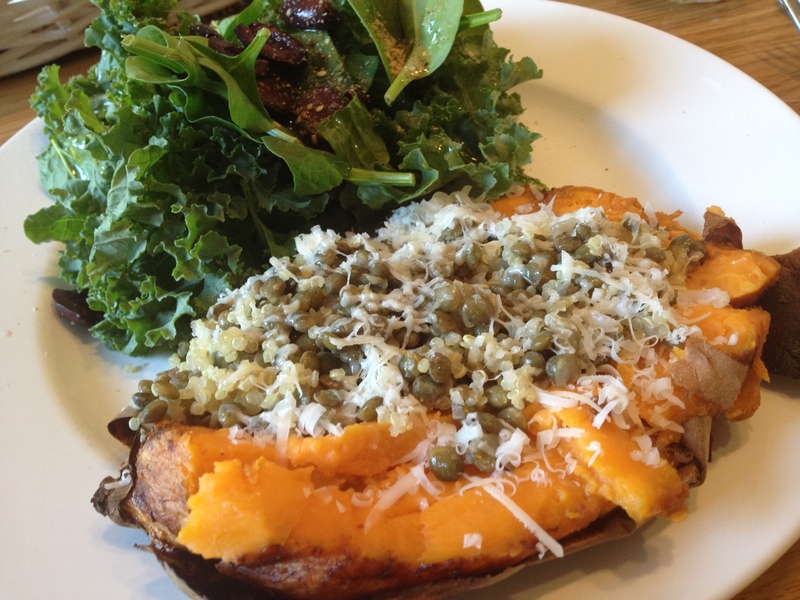 Baked potatoes make awesome lunches & dinners and are a healthy carbohydrate and starch. Scrub the potato, rub it with a little EVO, prick with a fork and throw it in the oven for about an hour at 350F. I use half of a baked potato per meal. 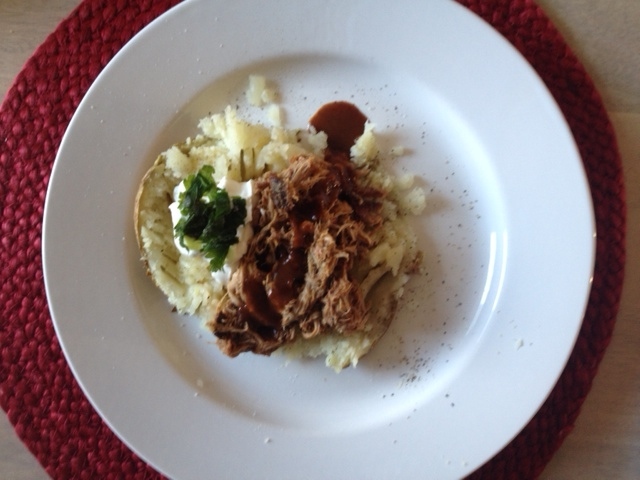 of sour cream and lunch is ready! 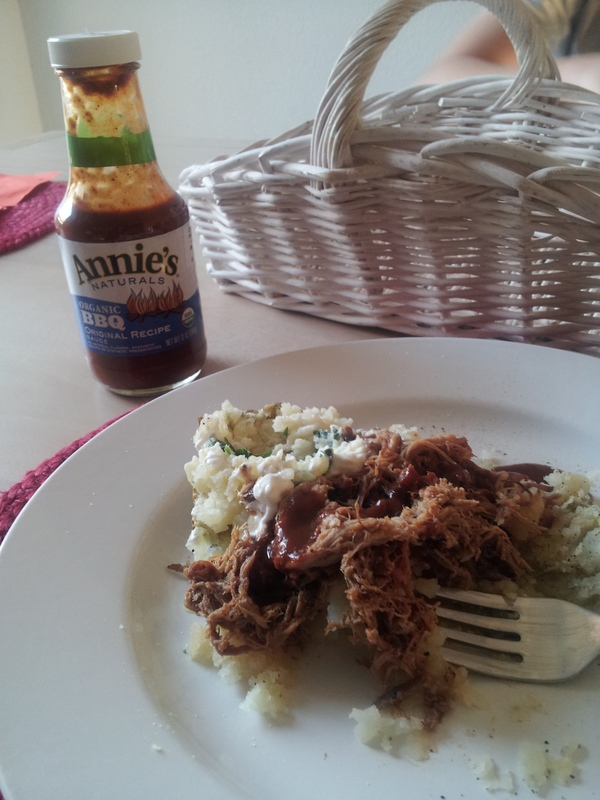 I tried out Annie’s Organic BBQ sauce and everyone seemed to like it. This BBQ sauce is a tangy, spicy mustard flavor, less sweet tasting. grated aged cheddar and a drizzle of EVO. 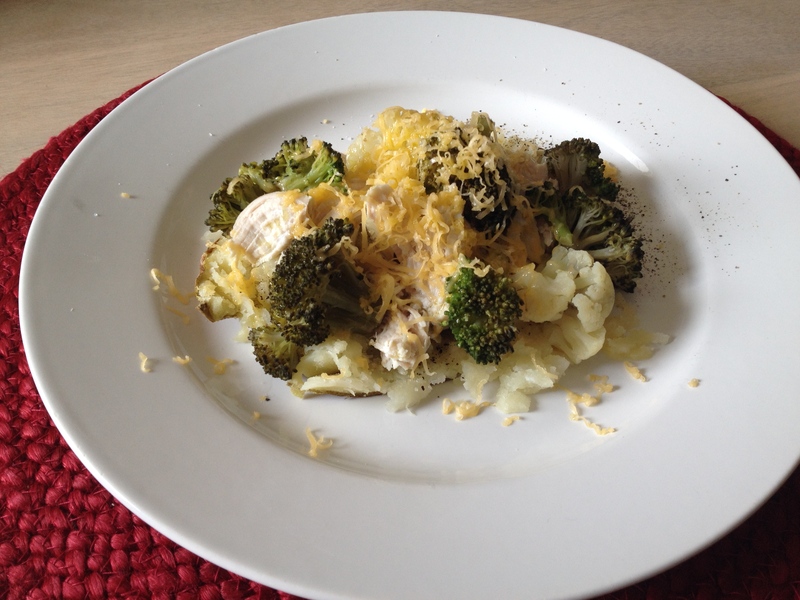 A delicious, quick, nutritious, easy to fix, meal. Since the beginning of Autumn I have been enjoying roasting all varieties of squash. Insistently trying to find a similar flavor to the Italian pumpkin I was used to preparing steamed, in bianco, in my minestrones and was the pumpkin I used in my delicious pumpkin & bacon sauce. 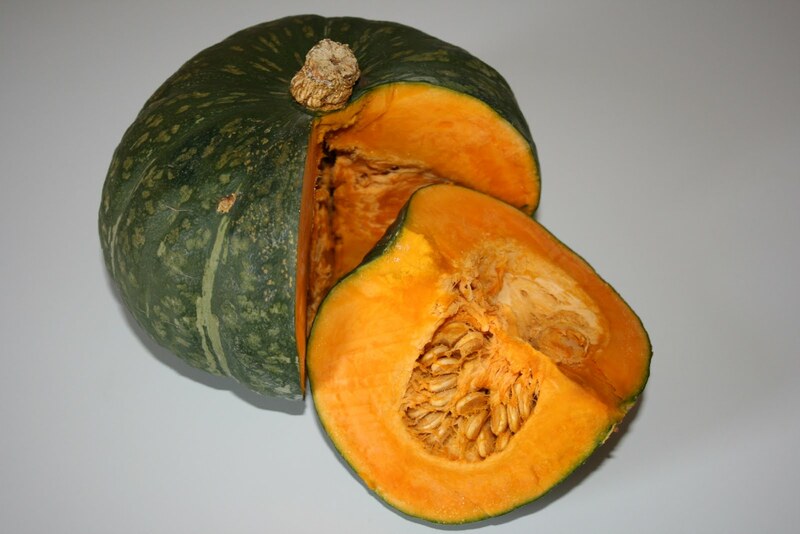 The pumpkin or “zucca Mantovana” I was familiar with was a green, grey color not very tall, or big, for that matter, with a stern, bright orange pulp. 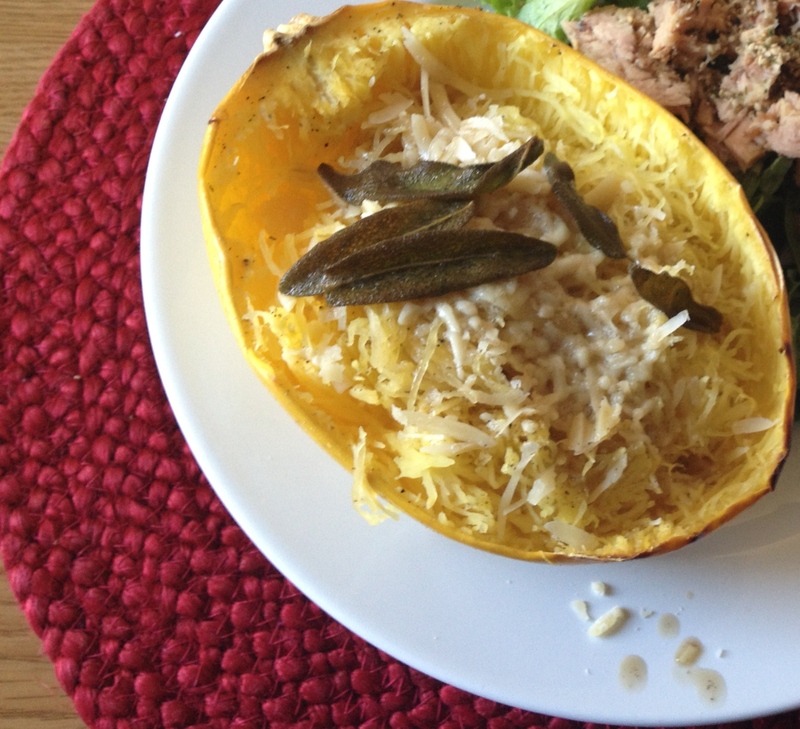 Meanwhile, during my hunt I turned to a different squash and decided to give Spaghetti squash the Royal treatment! I was putting this squash to the Test. A sort of bullish expectation, taking out my my nostalgic upsetness on a squash that calls itself “Spaghetti”. Okay Mr.Spaghetti squash, lets just see what you are capable of! So Spaghetti squash, time to show me your stuff! 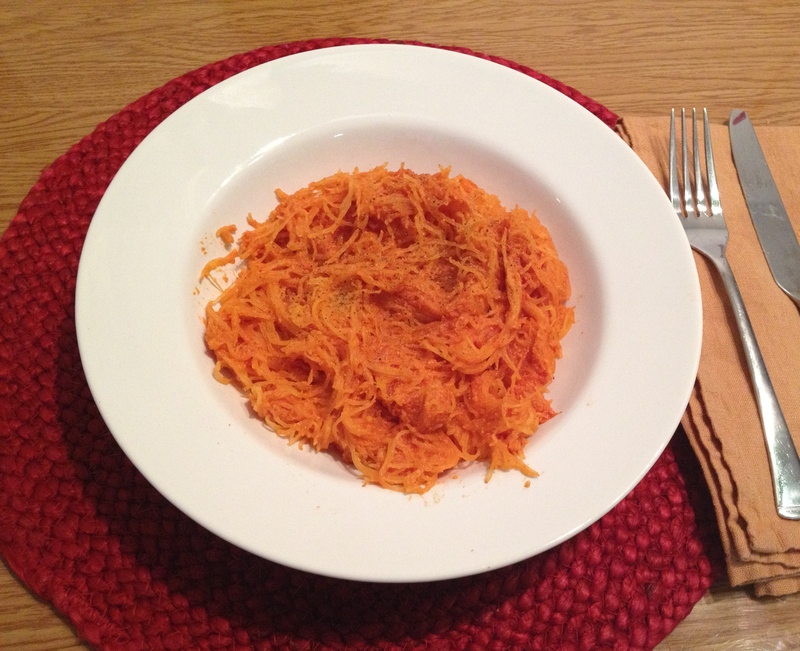 Ok, so, my 1st Test was Spaghetti squash “In bianco” or ” white or plain”. In bianco, is a condiment of butter or extra virgin olive oil. The butter either browned alone, with a few sage leaves or added in small pieces cold (it melts directly on the pasta itself or spaghetti squash in this case). With or without a grating of parmiggiano, you decide. I used browned butter and sage leaves and yes, parmiggiano. 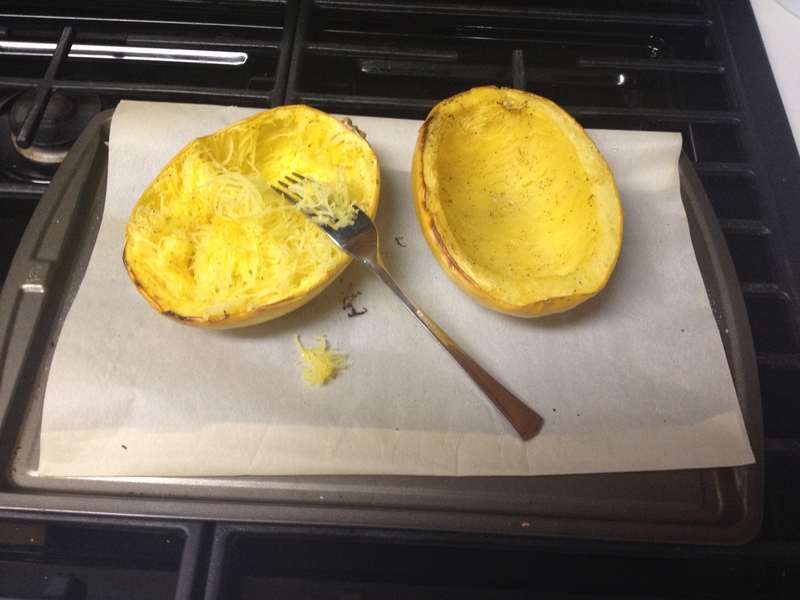 I treated my Spaghetti squash as a plate of pasta. I warmed my previously roasted Spaghetti squash in the microwave for 40 seconds, added a dash of salt & pepper and poured the browned butter & sage on the squash, mixed with a fork and added the parmiggiano on top. (For even more flavor the spaghetti squash can be put directly in the pan of browned butter and sage to warm up.) PASSED! I made Pesto, a somewhat lighter version, due to flavor as I spoke of above but a Basil Pesto none the less. ( I will take the time to write out my Pesto recipe in the future, I make it without measuring the ingredients so I will have to take some time to measure and write it down next time!) 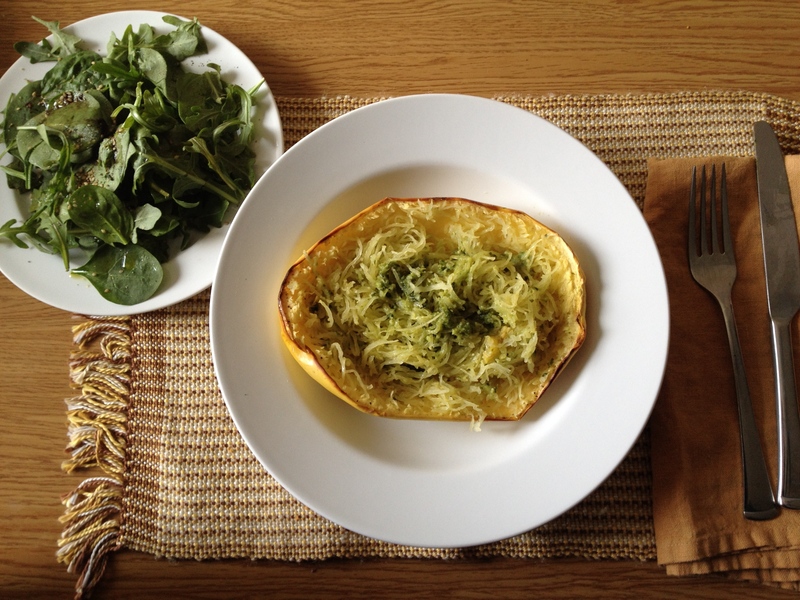 Spaghetti squash with pesto, Passed! “Al Pomodoro”, w/tomato. To make it a quick try I used what my children call The World’s Best Tomato sauce. After years and hours of pealing and deseeding tomatoes, making my own tomato sauce, which I happen to LOVE, my kids tell me that Mari’s tomato sauce is the best. Ofcourse my next move was to ask Mari her trick! So to find out she uses tomato paste. Yep, just tomato paste. No fresh tomatoes, no sautéed vegetables, not even onion or garlic. Just a tablespoon butter melted in a small pan a couple tablespoons of tomato paste and a little broth, fresh cream or a laddle of the cooking pasta’s water to liquify the sauce enough to serve it over, in this case, Spaghetti squash. A grating of Pariggiano and there it is, The World’sBest Spaghetti squash al pomodoro!! PASSED! 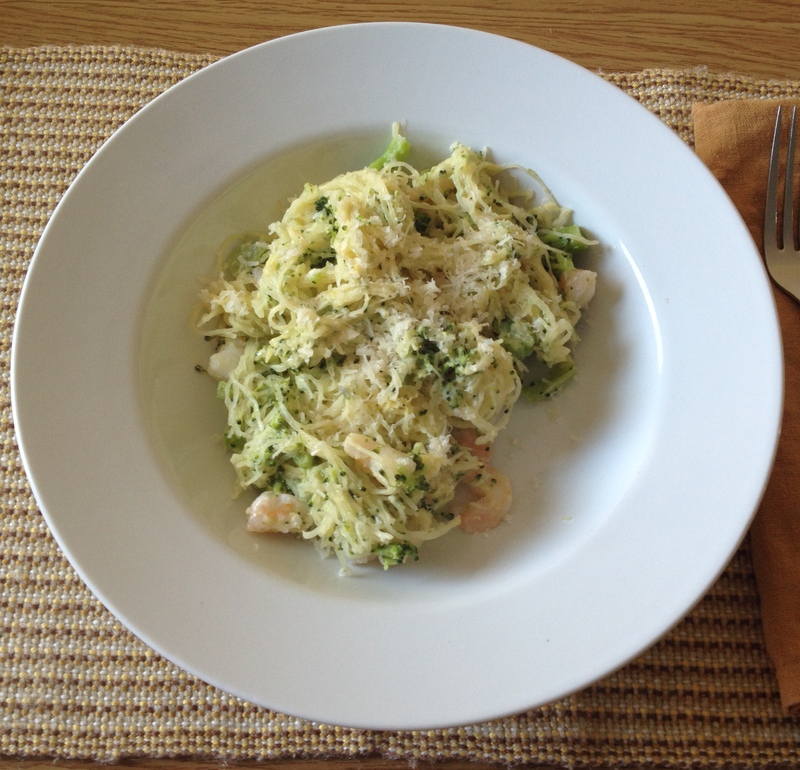 “Alfredo”, with broccoli and shrimp. I sautéed a clove of garlic and a small piece of onion, chopped, in a tsp or so of butter, I added a few broccoli florets and a few shrimp, salt & peppered, then added approximately 1/4 c heavy cream and a grating of parmiggiano. When warm and bubbly I added the spaghetti squash to the pan and cooked at low heat until warmed. Topped with parmiggiano and WOW, delicious! PASSED! My companion has come a long way, I’m sure he had NO idea what he was getting himself into when he commited himself to a relationship with me. He knew I loved to cook that I was a healthy eater and preferred homemade to dining out etc but….little did he know that I would get him to cut the diet soda, I would throw away that year supply tub of spreadable plastic he had sitting on the refrigerator door and propose grains, fruits and vegetables he’d never wanted to try nor even heard of before in his meals. FYI, his definition of fruit is applesauce and he hates bananas. How was this relationship going to work? I wondered myself. Meanwhile, I taught him the difference between applesauces and he buys natural applesauce and reads labels. My Mr.Wonderful usually comes with me to Whole Foods grocery shopping on the weekends. When we go, we stop for a bite also and enjoy what is going on, a little music, new foods to sample etc. He seems to enjoy it and has found things he likes or would like to try too! 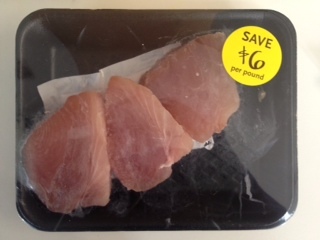 Last week at Whole Foods there was a Sale on Tuna steaks! Jeff agreed that these sounded like a good choice for one of our meals this week! Big step for one who doesn’t like fish either! 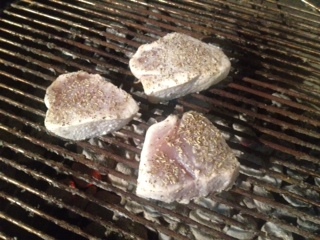 Our plan was to grill them! He prepared the Weber and I prep’d the steaks- Super Easy! 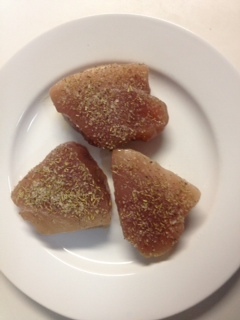 I wet the steaks with Evo and topped them with some herbed salt I brought with me from Italy . Similar to an Herb de Provence salt. We cooked them about 3 mins per side. The steaks were about 1 1/2inches thick. 100ml Evo, 1/3 lemon squeezed, 1 small clove garlic, parsley and pepper. I used my hand emulsion blender to blend the ingredients and Ta-da! Buon Appetito! 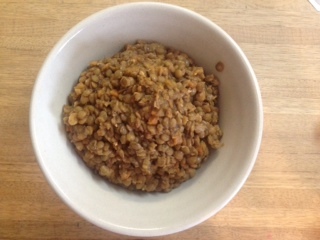 Stewed lentils, Lenticchie Stuffate in Italian, are amongst one of my favorite foods. And are soooo good for me! Lots of protein! Sautee’ the vegetables in the evo until onion is translucent. Add the rinsed Lentils to the pan and let sautee’ a couple minutes. Put the sautéed lentils and veggies in the crock pot on high and add 3 cups vegetable broth, tomato sauce and thyme. Cook for approx. 1 1/2 hrs. 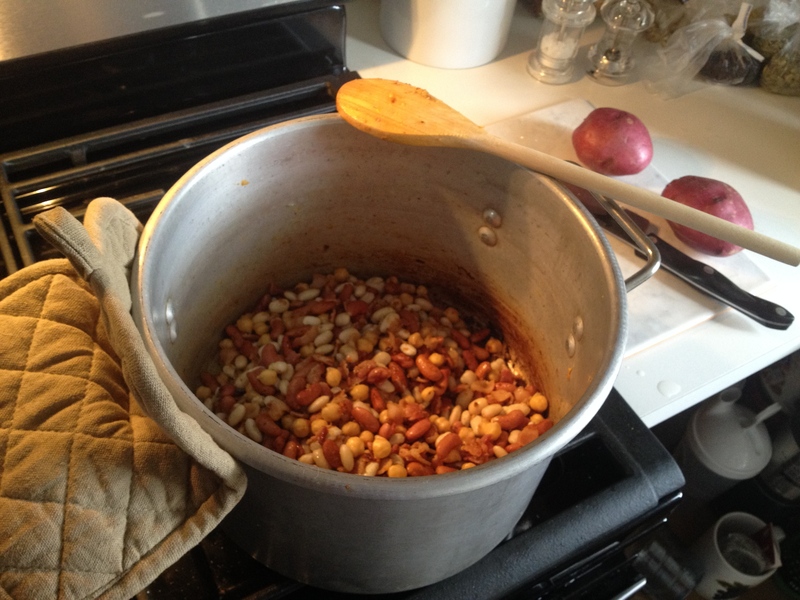 Add more broth if needed until lentils are soft, mixing occasionally. 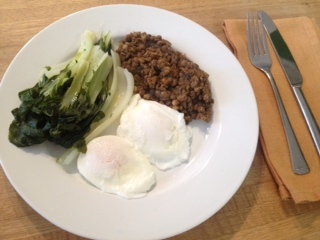 2 Poached eggs, steamed Bok Choy and stewed lentils, for breakfast, lunch or dinner, YUM!